Araceae is a broad class of plants which include my favorites; Antheriums, Philodendrons, Pothos & Monstera. Most of these plants make great house plants however some require a bit more humidity and light than normal. Scindapsus have been grouped in with the pothos as they often are however they are noted as scindapsus not pothos. Many of these plants are in growth or currently in propogation so if you are interested in something in particular please send us an email to inquire about availability if not listed as available. The most common of antheriums that are generally available in the market. The white flowers are on the smaller side on this plant but just as enjoyable. The most common of antheriums that are generally available in the market. This plant boasts a larger blood red flower with a arching yellow spath. Anthurium brownii is found from Costa Rica to Colombia and is an epiphyte by nature. It is a tough, easy to grow plant. The ruffled edges on the sinus overlap, making it easy to identify in a crowd. 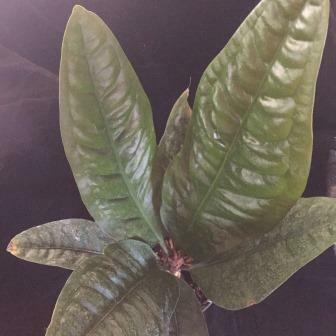 Also known as The Black Anthrium, Anthurium Cabrerense is a cool growing plant that requires higher air circulation and medium light and humidity. When grown properly you will be rewarded with the beautiful black flowers. Anthurium Superbum is an easy to grow, prehistoric looking, bird nest variety Anthurium well suited for interiorscapes, containers and tropical landscapes. The elliptical leaves are rigid and arranged in a upright rosette formation. Also known as the Swiss cheese plant, it gets its name from its large, heart-shaped leaves, which as it ages, becomes covered with holes that resemble Swiss cheese. This small leafed monstera has a vining tendenancy which makes it perfect for a hanging basket or to be grown on a moss pole. This large leafed monstera is also sometimes refered to as a swiss cheese plant but should not be confused with monstera adansonii. These large decorative leaves are a real statement and should mostly be grown on a moss pole to accomodate its size and vining tendancy. Easy adapts to most environments making it a great houseplant. Similarly shaped, but smaller statured leaves than M. pittierii, but seldom forms windows until mature.The leaf surface is entirely blushed with lovely ash-silver. Possibly a Raphidophora. This Monstera is an interesting plant with its heavely lobed segments on the leaves that almost cut into the spine. It is a mix of a clumping and climbing plant so you could either grow it in a hanger or on a pole. A wonderful glossy, strapped leafed, terrestrial philodendron that adds a bit of the tropics to your landscape. At maturity the leaves of this beautiful plant reach 3 feet or so in height and 4 to 6 inches in width while the stem remains underground. Very easy to maintain. An amazing selected waxy leaved charmer with the fiddle shaped leaves is lavishly slashed and splashed with nacre cream. This is a vining type philodendron best grown on a support or moss pole. Philodendron 'Black Cardinal' - A low growing clumping hybrid philodendron with dark green, almost black leaves. New emerging leaves are a beautiful glossy bronze colour. A low growing, clumping philodendron. A clumping variety with broad thick leaves burgundy of top bloody red underneath. Likes to dry between waterings min temps. 55 F. Easy are houseplant. Tolerant of neglect. Likes part sun to shade. This vining philodendron is often confused or grouped with pothos. Its wide heart shaped leaves are lined on the outside with a dark green and a yellow to cream multi layered splash down the center. Looks great in a hanging basket. Philodendron cordatum, commonly called the Heart Leaf Philodendron for its 2-4 inch heart-shaped leaves. This philodendron is a vining type and does well either in a hanging basket allowing its vines to trail or grown on a moss pole. An other strong variety is "Red Emerald". This is the red variety of the Philodendron erubescens (sometimes called Philodendron peperomia) and is a climbing, tropical plant. The plant is characterised by thin, wine-red colored stalks and green, glossy leaves. Interesting when you cut this plant it bleeds red. Philodendron gloriosum is a species of plant in the family Araceae, genus Philodendron. It is a crawling, terrestrial plant, native to Colombia whose foliage is characterized by cordate (heart-shaped) by a velutionous surface, pink margins, and pale green, white, or pinkish veins. Jose Buono is a climbing, large-leaf Phil. capable of climbing 10 feet in a single season. The vines on this highly variegated plant grow to one inch or more in diameter. In captivity, indoors on a totem, Jose is easy to grow and may only need to be trimmed once a year or so. Philodendron "Lemon Lime" is a lovely coloured philodendron, which climbs happily, but would be equally at home in a hanging basket. New leaves are a bright lime green, almost yellow, and become darker with age, so that the plant is a mixture of lighter and darker green leaves at all times. The base of the leaf stems have a faint maroon. Philodendron Longipetiolatum also known as Philodendron sphalerum. This strap leafed vining philodendron grows at a very rapid rate. Long aerial Roots help support this philodendron as it grows in size and length. Mature leaves can reach 2 ft in length. A very easy to grow, rewarding plant well suited for a moss pole. The philodendron is also referred to as the oak leaf philodendron and could also appear under other names Philodendron laciniatum, Philodendron quericifolium, Philodendron amazonicum or Philodendron laciniosum. With its deeply lobed leafs it is ok with lower light and normal household humidity. A easy to grow, rewarding plant well suited for a moss pole. Black to deep burgundy glossy heart-shaped tropical foliage that is splashed and flecked with white and pink. An easily grown indoor or tropical plant that is sure to make a statement. This is a slow growing vine-like philodendron which can be trained to a support or allowed to trail in a hanging basket. Brazil's "Lacy Tree Philodendron" remains the most reliable of dramatic houseplants with large deeply lobed leathery leaves radiating from the thick succulent trunk sprouting curious aerial roots and greenish white flowers. 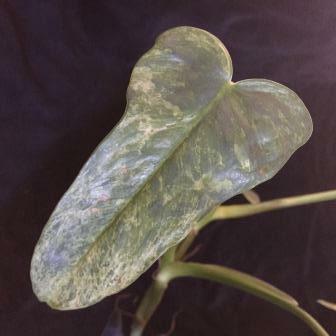 Philodendron Sodiroi is an interested plant with its beautiful leaves splashed with a silver overlay. This vining type philo enjoys medium light and a good amount of humidity. Grown properly the leaves can become an amazing size. Philodendron subhastatum is a species with green long leaves. The leaves get 2 feet in length and 4 to 6 inches wide. Even thought the plant does not have a lot of color it is a nice grower and can make a show once grown up a totem. The back of the leaves show a lovely red to burgany color. This climbing philodendron features large heart-shaped leaves which begin pale and darken with age, juvenile leaves feature a maroon pattern on the underside. The Philodendron Xanadu, sometimes referred to as Philodendron Winterbourn, is a large compact easy to grow plant. Each shiny green leathery leaf has 15-20 distinct lobes. A Xanadu is often wider than it is tall, reaching a height of 2-4ft. and a width of 3-5ft in ideal conditions.Xanadu is an upright plant not a climber or vine. Epipremnum aureum Golden Pothos are one most popular of all house plants. They are attractive, durable and easy to grow vines that have smooth, leathery, heart shaped leaves with distinctive marbling alternating along rope-like green stems. Epipremnum aureum 'Manjula' Manjula pothos shows off creamy-white leaves edged and variegated in green. Pothos 'Marble Queen' has beautiful green and white marbled foliage, its white background is heavly flecked with green. I have found that Marble queen has a habit of reverting to a solid green and would suggest if this happens you remove the solid foliage as to not let it overpower the varigated sections. An electric green color variation on the standard Pothos. 'Neon' has all of the tough, reliable features houseplant lovers have come to expect from Pothos showing off its glowing, neon-green foliage. Grow this one in a hanging basket or let it grow up a moss pole to really show off its beauty. Pothos N'joy is another fine example of this easy to grow house plant. N'joy features a leaf with a white margin surrounding the green center which at times can be different shades of green. Easy to grow as a hanging plant on a pole or just enjoyed in a pot. As apposed to Pearls and Jade N'joy does not show speckling in the white areas however it may show some at times. Pearls and Jade pothos is a sport of the variety 'Marble Queen' and features smaller white-edged, gray-green leaves streaked with cream, white, and gray. It's smaller and slower-growing than other pothos varieties. Pearls and Jade is sometimes confused with N'joy however N'joy does not have the additional splashes of green in the white sections. I found this Scindapsus while plant shopping but can't seem to find any detailed information on this named variety. I have leaf checked it against 'Silver Ann' and 'Silver Satin'. This plant seems to have more green than silver on the leaves with small flecks of silver showing. An interesting addition. New to us so propigation will be forth coming. SCINDAPSUS PICTUS SILVER ANN - SILVER ANN POTHOS - SILVERY ANN POTHOS - A new variety with velvet textured green leaves that have a metallic silver patching. A very irregular leaf pattern with some leaves fully silver. Similar but different than Satin Pothos. Vining or trailing habit. Silver Satin is very similar to 'Silver Ann' in its appearance however this plant has larger heart shaped leaves that show off a metallic silver spotting and patching. Makes a great plant in a hanging basket or growing up a moss pole.